Appropriate technology was first popularized by E. F. Schumacher in his classic book Small is Beautiful: A Study of Economics As If People Mattered. Appropriate technology can be defined as those technologies that are easily and economically utilized from readily available resources by local communities to meet their needs. AT must meet the boundary conditions set by environmental, cultural, economic, and educational resource constraints of the local community. From its beginning in the 1970s, AT was open source. Back then you had to send a self-addressed stamped envelope to non-profit organizations that would send you back photocopied plans. Today, sharing AT is more digital and much faster. Thus, open source appropriate technology (or OSAT), refers to technologies that are designed in the same fashion as free and open source software (FOSS), but are appropriate for their local communities. 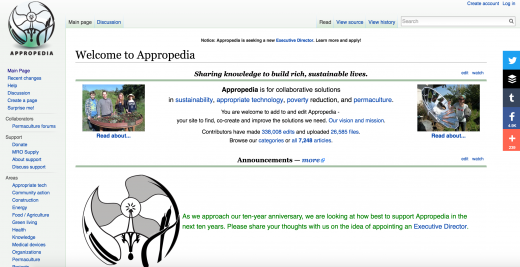 Appropedia.org, the primary site for collaborative solutions in sustainability, poverty reduction, and international development, is an excellent example of a repository for open source appropriate technology that harnesses the power of distributed peer review and transparency of process. Appropedia is a wiki-based website like Wikipedia, a website where a large number of participants are allowed to create and modify the content directly from their web browsers. Appropedia has enormous potential to assist in sustainable development because it simplifies the administration of collaboratively organizing information, project examples, best practices, and howtos. In Appropedia anyone from anywhere in the world can learn how to make and use AT free of patent and intellectual property concerns. At the same time anyone can add to the collective open source knowledge ecosystem by contributing ideas, observations, experimental data, and deployment logs. Appropedia easily enables people from multiple countries to collaborate on a project or technology. The projects listed above, and hundreds more, already work for someone somewhere in the world. Because their developers chose to share them, we can all benefit. With the built-in continuous peer-review they are constantly evolving and improving. You do not need to be an expert in sustainable development to help improve Appropedia. Simply click the edit button on any page you find interesting to correct spelling errors and grammar from non-native English speakers. This is something almost everyone can do. You can also translate the best articles into other languages you know, improve technical content on other users' projects, ask questions on the discussion pages, and start housing your own OSAT project on Appropedia. The open source approach is expected to result in better quality, higher reliability, and more flexibility than conventional design and patenting of technologies. The free nature of the knowledge (everything on Appropedia is licensed CC BY-SA) also provides lower costs, particularly for those technologies that do not benefit to a large degree from scale of manufacture (e.g., distributed manufactured organic farm equipment). Finally, OSAT also enables the end to predatory intellectual property lock-in. This is particularly important in the context of technology focused on relieving suffering and saving lives in the developing world. Although it is clear that OSAT can provide a clear path for open source development of humanitarian tools, often the projects that gain the most traction are those where the initial developer is trying to solve her own problem. Solutions for your problem—whether it is water conservation in your bathroom or cutting down on your apartment's energy bills with a new technology—may also be appropriate for others throughout the world. Share such OSAT and we all grow rich. Great article. I never knew about any of this.